Most visitors to Ko Lanta are travelling from Phuket by boat via Phi Phi Island. Just only during the travelling season start November to April. The boat leaving at 08:30 from a pier in Phuket town. The boat arrives at Phi Phi Island around 10:30 and the connecting boat departs at 11:30 and spend another one hour to Ko Lanta. From November to April, the boats for the return trip leave from Saladan Pier at 08:00 and 13:00 to arrive at Phi Phi Island about one hour later. 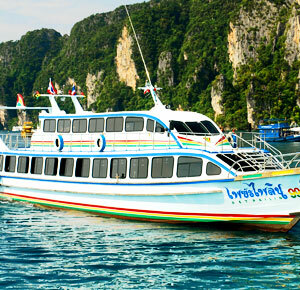 If the morning boat is in time, you might change to the expressboat from Phi Phi Island to Phuket on the open sea and you will arrive to Phuket Town around 11:00. If you take the afternoon choice, you have to change the boat at the pier on Phi Phi Island and will reach Phuket Town around 16:30. From May to October the boats from Phi Phi Island to Ko Lanta do not operate dueto strong winds and high waves in the monsoon season. During this time the private transfer is the only choice to go to Ko Lanta. A lot of tourists visit Ko Lanta from Phuket during the high season.